Chemistry Teachers work at high schools and Universities and teach students on the concepts of basic, intermediate and advanced Chemistry. 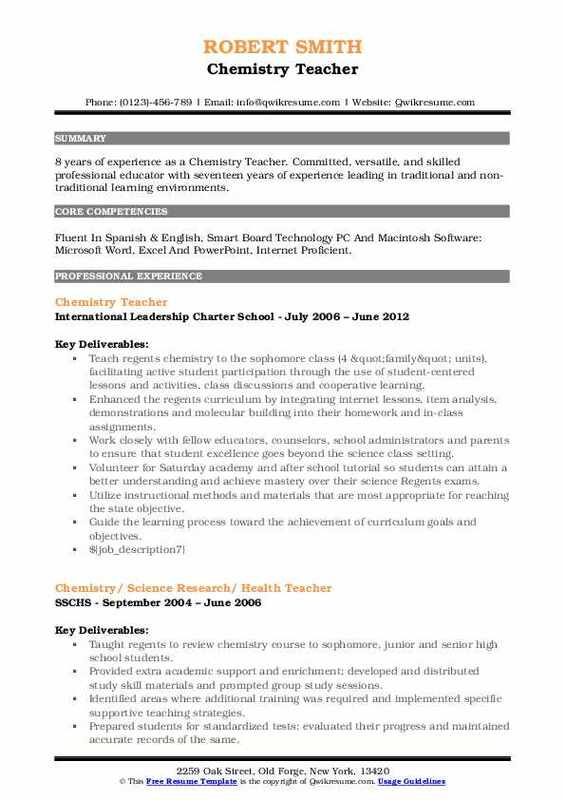 The major roles and responsibilities listed on Chemistry Teacher Resume include – drafting lesson plans, teaching chemistry subjects to assigned classes, monitoring the academic performance of students, supervising and motivating students, developing instructional plans, attending educational trainings and workshop, assisting students in using laboratory tools and equipment, and revising curriculum plan when needed. 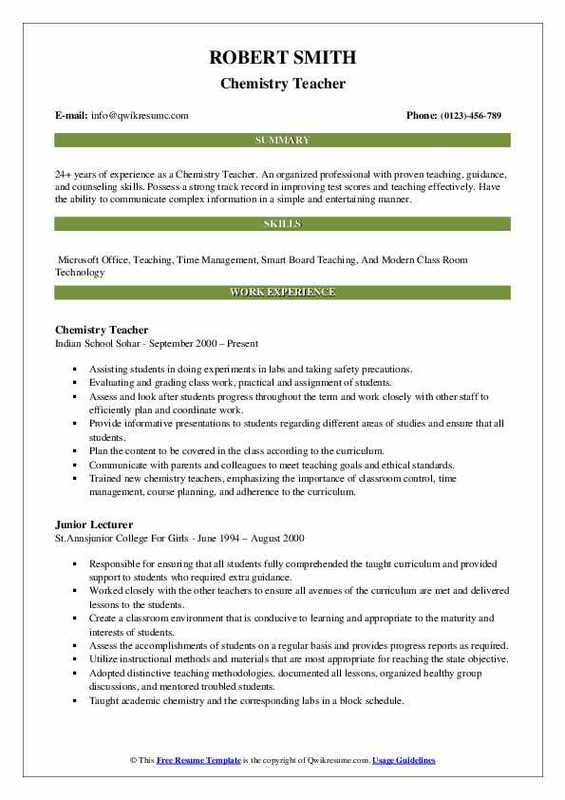 The skills and qualifications commonly found on successful resumes include –strong leadership and teaching skills, keeping up-to-date with latest developments in chemistry and teaching techniques, the ability to manage students in a classroom environment, the potential to evaluate students’ needs and progress, and experience in creating curricula. 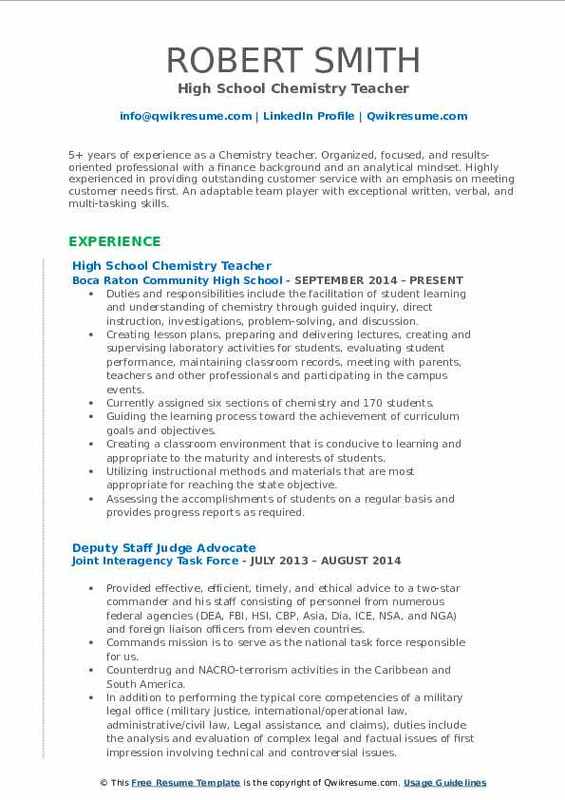 Candidates applying for this teaching post should have a Master’s Degree in Chemistry and a degree in education as well. 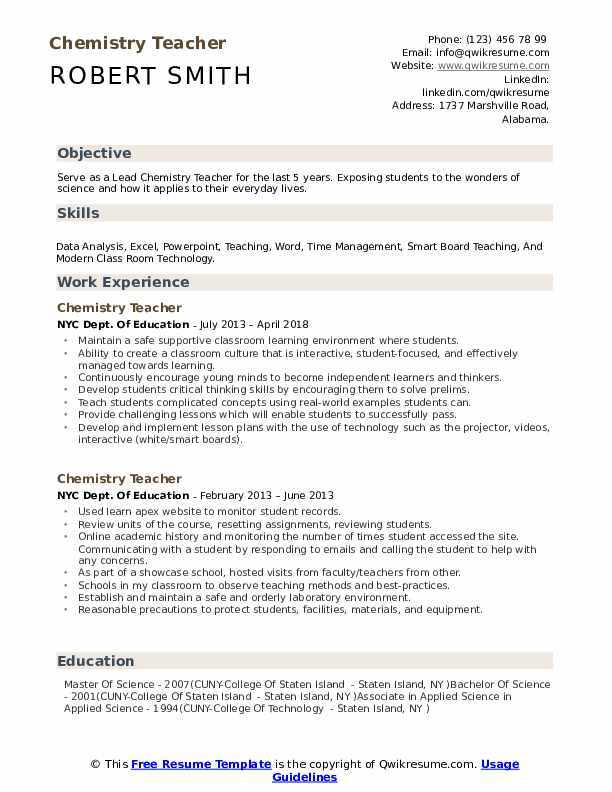 Objective : Serve as a Lead Chemistry Teacher for the last 5 years. Exposing students to the wonders of science and how it applies to their everyday lives. Skills : Data Analysis, Excel, Powerpoint, Teaching, Word, Time Management, Smart Board Teaching, And Modern Class Room Technology. Maintain a safe supportive classroom learning environment where students. Ability to create a classroom culture that is interactive, student-focused, and effectively managed towards learning. Continuously encourage young minds to become independent learners and thinkers. Develop students critical thinking skills by encouraging them to solve prelims. Teach students complicated concepts using real-world examples students can. Provide challenging lessons which will enable students to successfully pass. Develop and implement lesson plans with the use of technology such as the projector, videos, interactive (white/smart boards). Manage para-professionals to assist in classroom management such as class. Summary : 25 years of extensive experience as a Chemistry Teacher. An organized, goal-oriented, team player that has excellent communication skills, training skills and has a keen ability to manage people and budgets. Skills : IBM, Macintosh, And Mainframe Computers, CISCO Network. Computer Software - Microsoft Windows, Office, Works, Access, Excel, Lotus 123, DBASE, Word Perfect, Publisher, PowerPoint, And Others. Taught high school sciences including biology, chemistry, conceptual chemistry, physics, environmental science, spectrum science, and general science. Created course materials such as syllabi, homework assignments, obtained materials and supplies such as textbooks, laboratory equipment, and supplies. Planned, evaluated, and revised lesson plans and course content/ materials and methods of instruction to facilitate, and moderate classroom discussions, and student-centered learning. Prepared solutions, supervised laboratory work, showed proper use of chemicals and their interactions, danger signs, production techniques, safety, and disposal methods. Taught chemical composition, structure, and properties of substances and the chemical processes and transformations that they undergo. Technology team leader responsible for all aspects of computer and network support and maintenance. Network scope included more than 300 computers. Computer problem troubleshooting, arranged for external repairs when necessary. Summary : 24+ years of experience as a Chemistry Teacher. An organized professional with proven teaching, guidance, and counseling skills. Possess a strong track record in improving test scores and teaching effectively. Have the ability to communicate complex information in a simple and entertaining manner. Assisting students in doing experiments in labs and taking safety precautions. Evaluating and grading class work, practical and assignment of students. Assess and look after students progress throughout the term and work closely with other staff to efficiently plan and coordinate work. Provide informative presentations to students regarding different areas of studies and ensure that all students. Plan the content to be covered in the class according to the curriculum. Communicate with parents and colleagues to meet teaching goals and ethical standards. Trained new chemistry teachers, emphasizing the importance of classroom control, time management, course planning, and adherence to the curriculum. Taught two levels of high school introductory chemistry as well as ap chemistry. Developed majority of class and lab materials independently. Headline : 5+ years of experience as a Chemistry teacher. Organized, focused, and results-oriented professional with a finance background and an analytical mindset. Highly experienced in providing outstanding customer service with an emphasis on meeting customer needs first. An adaptable team player with exceptional written, verbal, and multi-tasking skills. Skills : Excel/Microsoft Office, Administrative Duties, Teaching, Entrepreneurial, Google Docs, Curriculum Development, Curriculum Design, Teaching, Communications, And Training. Duties and responsibilities include the facilitation of student learning and understanding of chemistry through guided inquiry, direct instruction, investigations, problem-solving, and discussion. Creating lesson plans, preparing and delivering lectures, creating and supervising laboratory activities for students, evaluating student performance, maintaining classroom records, meeting with parents, teachers and other professionals and participating in the campus events. Currently assigned six sections of chemistry and 170 students. Guiding the learning process toward the achievement of curriculum goals and objectives. Creating a classroom environment that is conducive to learning and appropriate to the maturity and interests of students. Utilizing instructional methods and materials that are most appropriate for reaching the state objective. Assessing the accomplishments of students on a regular basis and provides progress reports as required. Headline : 6 years of experience as a Chemistry Teacher. 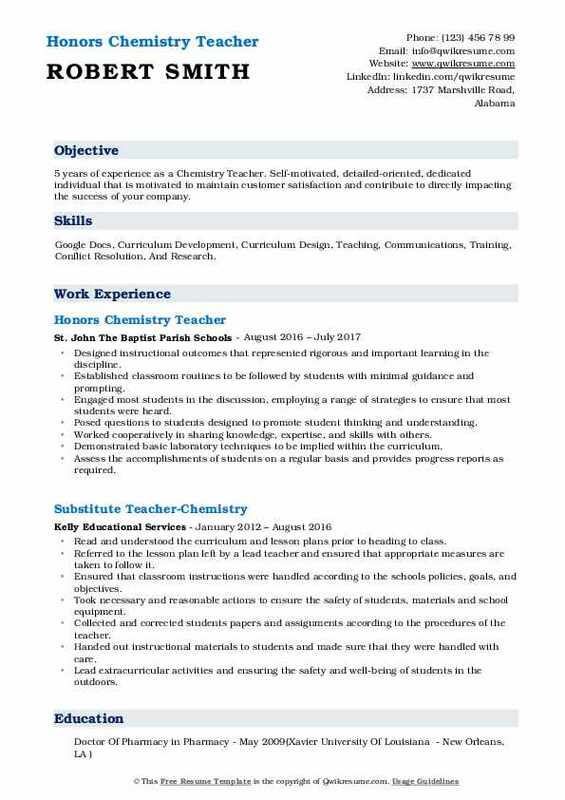 Detail oriented, highly organized, and innovative former chemistry teacher with a solid academic background in chemistry along with extensive knowledge in many diverse fields. Ability to quickly master the necessary skills and adapt to new situations in order to complete any given task. Skills : Inventory Management, Extensive Lab Knowledge, Strong Ability To Present And Train Individuals. Successfully initiated the districts first advanced placement chemistry class with a systematized chemical inventory and storage according to OSHA standards. Helped to raise standardized scores in chemistry from a 32% "at or above proficient" passing rate to 45% "at or above proficient" passing rate over the course of two years. Designed and implemented novel chemistry labs to teach both kinesthetic and tactile. Incorporated technology in the classroom via the Promethean board, response clickers, and Bluetooth probe ware. Designed and implemented a differentiated supervision plan as part of the differentiated supervision team. Teach 5 sections of chemistry, develop and oversee the chemistry curriculum, including the design and implementation of a project-based course. Developed hands-on projects and course units, student-led and inquiry-based laboratories, and the expanded use of technology into all areas of the chemistry curriculum. 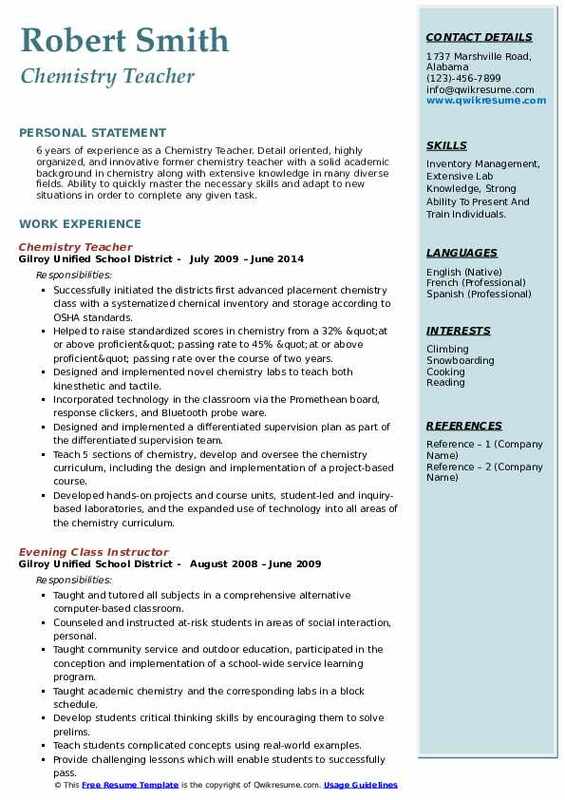 Objective : 5 years of experience as a Chemistry Teacher. Self-motivated, detailed-oriented, dedicated individual that is motivated to maintain customer satisfaction and contribute to directly impacting the success of your company. Skills : Google Docs, Curriculum Development, Curriculum Design, Teaching, Communications, Training, Conflict Resolution, And Research. Designed instructional outcomes that represented rigorous and important learning in the discipline. Established classroom routines to be followed by students with minimal guidance and prompting. Engaged most students in the discussion, employing a range of strategies to ensure that most students were heard. Posed questions to students designed to promote student thinking and understanding. Worked cooperatively in sharing knowledge, expertise, and skills with others. Demonstrated basic laboratory techniques to be implied within the curriculum. 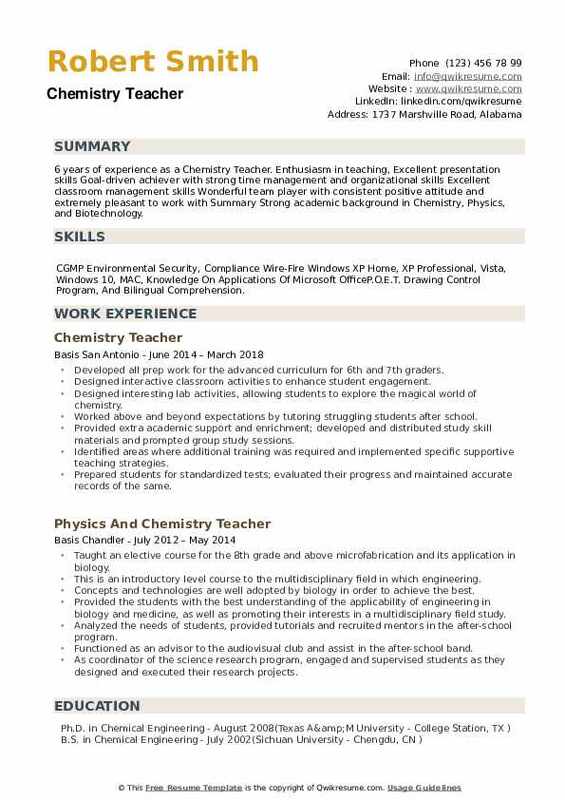 Summary : 8+ years of experience as a Chemistry Teacher is looking to obtain a laboratory or research position with advancement opportunities at a company that values employee input and observes a positive environment. 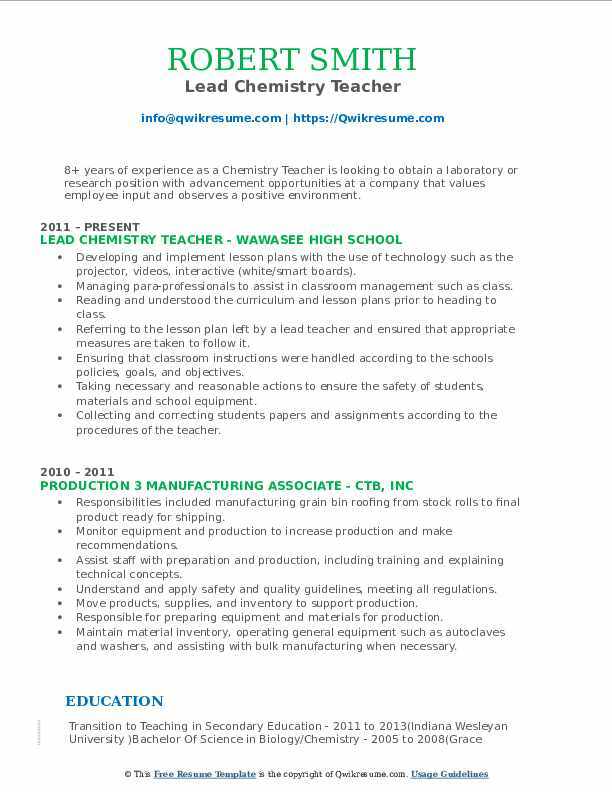 Skills : MS Office Proficient, Resource Management Experience, Teaching, Problem Solving, Media Center Instruction, And Telemarketing Experience. Developing and implement lesson plans with the use of technology such as the projector, videos, interactive (white/smart boards). Managing para-professionals to assist in classroom management such as class. Reading and understood the curriculum and lesson plans prior to heading to class. Referring to the lesson plan left by a lead teacher and ensured that appropriate measures are taken to follow it. Ensuring that classroom instructions were handled according to the schools' policies, goals, and objectives. Taking necessary and reasonable actions to ensure the safety of students, materials and school equipment. Collecting and correcting students papers and assignments according to the procedures of the teacher. Summary : 8 years of experience as a Chemistry Teacher. Committed, versatile, and skilled professional educator with seventeen years of experience leading in traditional and non-traditional learning environments. Skills : Fluent In Spanish & English, Smart Board Technology PC And Macintosh Software: Microsoft Word, Excel And PowerPoint, Internet Proficient. Teach regents chemistry to the sophomore class (4 "family" units), facilitating active student participation through the use of student-centered lessons and activities, class discussions and cooperative learning. Enhanced the regents' curriculum by integrating internet lessons, item analysis, demonstrations and molecular building into their homework and in-class assignments. Work closely with fellow educators, counselors, school administrators and parents to ensure that student excellence goes beyond the science class setting. Volunteer for Saturday academy and after school tutorial so students can attain a better understanding and achieve mastery over their science Regents exams. Utilize instructional methods and materials that are most appropriate for reaching the state objective. Guide the learning process toward the achievement of curriculum goals and objectives. 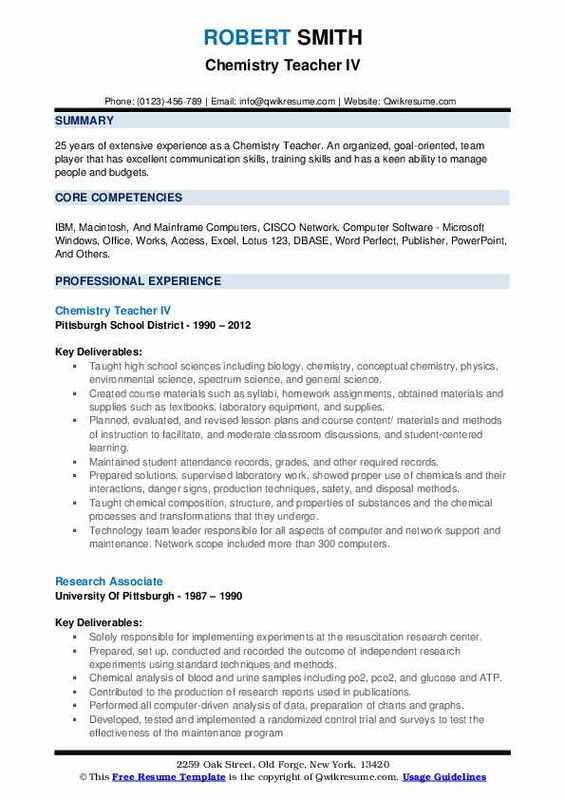 Objective : 3+ years of experience as a Chemistry Teacher is now seeking to explore new challenges in the chemistry profession and apply my scientific knowledge and strengths in a new environment. Skills : Highly Organized, Classroom Management, Creative Problem Solving, Quick Thinker, Think On My Feet, Customer Service, And Highly Motivated. Providing classroom instruction for the following high school level courses: chemistry, ap chemistry, and 7th-grade science. Developing lesson plans and instructional material and provide group instruction to adapt the state curriculum standards to meet the needs of all students. Creating a positive learning environment for students by providing organized, structured lessons, and laboratory activities, and by motivating students with enthusiasm and a positive attitude. Facilitate, monitor, and assess student learning by evaluating student performance, collaborating with peers, counselors, parents, and guardians. Assuming responsibility for the instruction of assigned students in chemistry, in accordance with the course of study which was approved by the board of education. Designing and implementing a general chemistry course for low-level learners. Headline : 6 years of experience as a Chemistry Teacher. 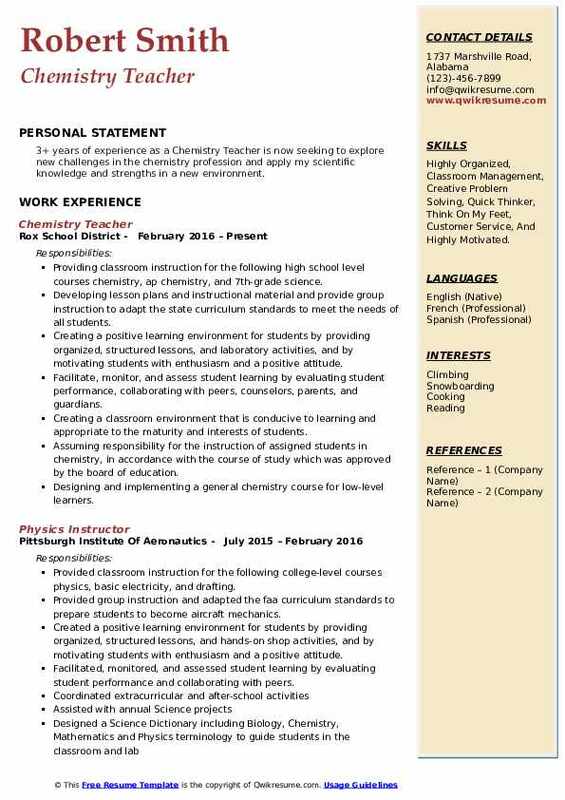 Enthusiasm in teaching, Excellent presentation skills Goal-driven achiever with strong time management and organizational skills Excellent classroom management skills Wonderful team player with consistent positive attitude and extremely pleasant to work with Summary Strong academic background in Chemistry, Physics, and Biotechnology. Skills : CGMP Environmental Security, Compliance Wire-Fire Windows XP Home, XP Professional, Vista, Windows 10, MAC, Knowledge On Applications Of Microsoft OfficeP.O.E.T. Drawing Control Program, And Bilingual Comprehension. Developed all prep work for the advanced curriculum for 6th and 7th graders. Designed interactive classroom activities to enhance student engagement. Designed interesting lab activities, allowing students to explore the magical world of chemistry. Worked above and beyond expectations by tutoring struggling students after school. Provided extra academic support and enrichment; developed and distributed study skill materials and prompted group study sessions. Identified areas where additional training was required and implemented specific supportive teaching strategies. Prepared students for standardized tests; evaluated their progress and maintained accurate records of the same. Developed and taught highly interactive regents chemistry curriculum and science research to an intellectually heterogeneous student population.